97% Owned investigates behind the scenes of the ever changing financial system, to uncover how the monetary system provides the foundations for international dominance and national control. Fresh thinking, new ideas and answers to simple questions are squeezed into this powerful expose. When money drives almost all activity on the planet, it's essential that we understand it. Yet simple questions often get overlooked - questions like: where does money come from? Who creates it? Who decides how it gets used? And what does that mean for the millions of ordinary people who suffer when money and finance breaks down? 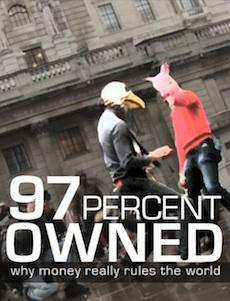 97% Owned is a new documentary that reveals how money is at the root of our current social and economic crisis. Featuring frank interviews and commentary from economists, campaigners and former bankers, it exposes the privatised, debt-based monetary system that gives banks the power to create money, shape the economy, cause crises and push house prices out of reach. Fact-based and clearly explained, in just 60 minutes it shows how the power to create money is the piece of the puzzle that economists were missing when they failed to predict the crisis. Produced by Queuepolitely and featuring Ben Dyson of Positive Money, Josh Ryan-Collins of The New Economics Foundation, Ann Pettifor, the "HBOS Whistleblower" Paul Moore, Simon Dixon of Bank to the Future and Nick Dearden from the Jubliee Debt Campaign, this is the first documentary to tackle this issue from a UK-perspective, and can be watched online now.